During of the 84th Legislative Session, HB 1842 was passed in order to provide more local control in certain areas. HB 1842 allows a traditional public school to utilize the exemptions in Education Law that charter schools currently are entitled to. We feel this is a great opportunity for our local district to create a plan based on the needs of our students and community that will remain in effect for the next five years (2017-2022). The proposed plan, once adopted, will remain in effect for the next five years (2017-2022). The plan may be amended at any time by the District of Innovation Committee with the approval of the school board. Districts are not exempt from statutes related to curriculum, graduation requirements, nor academic and financial accountability. The term of the District of Innovation Plan will be in place for the 2017 – 2018 school year through the 2021 – 2022 school year unless amended or terminated by the Board of Trustees in accordance with the law. 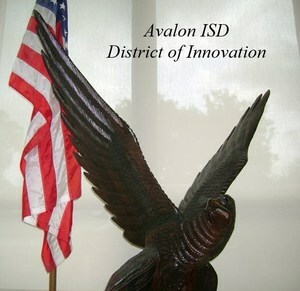 The Avalon ISD District of Innovation Committee will revisit the plan annually to ensure that the recommendations still meet the needs of the district. Avalon ISD requests the freedom to develop a calendar that better fits the needs of the community should the committee choose to. Having greater flexibility in this area would allow the District Committee to better balance the first and second semesters, align dual credit course dates and provide more instructional days prior to state testing. Texas Education Code Section 21.003 states that “a person may not be employed as a teacher, teacher intern, teacher trainee, librarian, educational aide, administrator, educational diagnostician, or school counselor by a school district unless the person holds an appropriate certificate or permit issued as provided by Subchapter B”. The current certification requirements inhibit the District’s ability to hire effective instructors to teach Career and Technical Education, languages other than English, and fine arts. Avalon ISD would like to establish its own local qualification requirements for such courses in lieu of the requirements set forth in the law in order to provide more students the opportunity to take such courses and obtain professional certifications. Current education law defines a teacher contract as a ten-month contract equivalent to 187 days. Avalon ISD would like to reduce teacher contract days from 187 to 182 with no effect on teacher salaries. This somewhat makes an attempt to align the teacher days to the 75,600 minutes required of students. This proposal will increase the daily rate the district pays teachers. This will enhance teacher recruitment, therefore putting the district on a more level playing field with larger districts.